Clarence Children’s Services is a community based, not for profit service sponsored by the Clarence City Council. The council has been providing child care services to the community for over forty years. We offer excellence in care across all service types and are commited to meeting the individual needs of your child. Council sponsors one of the largest Family Day Care Schemes in Tasmania, which is funded by the Commonwealth Government. 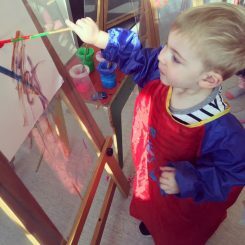 Clarence Family Day Care is a quality child care service that offers professional and flexible care in small groups for children from birth to 13 years of age within the private homes of registered educators (carers). The scheme has registered educators (carers) throughout southern Tasmania, including Clarence, Brighton, Glenorchy, Hobart and Sorell. Rosny Child Care Centre is located in Loinah Road, Montagu Bay next to the Clarence Aquatic Centre. We are licensed to care for 38 children aged from eight months to five years. Rosny’s small size enables us to cater for the individual needs of children in a warm and friendly environment. The centre offers full day, weekly and half day bookings with trained, professional and experienced staff providing consistent high quality care.